We received a call from Florida Fish & Wildlife last night, asking if we had room for her. This cub’s mother was hit by a car and she was still attempting to nurse as her mother’s body was collected from the roadside. She arrived this morning. This late in the year, Florida black bear cubs are normally old enough to survive on their own even if something happens to their mother. This little girl, however, is stunted for some reason and only weighs about 25 pounds. Most cubs are practically double that weight by the end of October. We named her Greta, although she will not really learn her name. Since we will not let her see or hear humans at the sanctuary, she will not actually be spoken to, but we will call her by name when we refer to her among ourselves. Remaining silent in the area of her habitat and staying on the opposite side of our visual barriers is extremely important to ensure that she retains her current fear of people and wild nature. If an orphaned cub is very young or needs medical attention, we will allow a staff member to have limited contact as long as it is required to ensure that the cub would grow to be healthy enough for release. As soon as they are healthy enough to simply need food and time to gain weight (like Greta), it is our job to ensure that they have no contact with people so that they do not learn to associate humans with food. Proper shyness of humans is what will keep her deep in the forest where she will be released – far away from people. With everyone’s generous support, Greta and all of the animals at the sanctuary will have the nutritious food and excellent veterinary care they deserve. We will keep you posted on her progress as she gains weight and is released back into the wild! 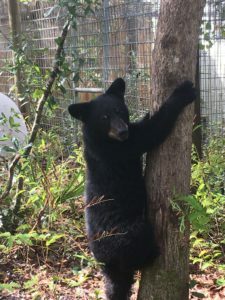 This entry was posted in Uncategorized and tagged bear rehabilitation, Bear rescue, florida bear hunt, Florida Fish & Wildlife Conservation Commission, florida fish and wildlife, florida fish wildlife, FWC, greta, orphaned bear cub, Peace River, sanctuary. Bookmark the permalink.